Mama bird made her nest on top of our security light, which I think is a lovely thought! She laid four little white eggs in it. 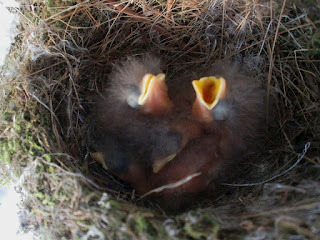 Within days we had tiny little baby birds. They never made a peep the entire time, but they sure looked hungry! It was absolutely amazing to watch them change and grow. I had never really seen the process before, so I was out checking on them every day. Yes, there are still four babies in the nest. I think the one on the bottom will probably have some stunted growth for the rest of his life. He was sat upon for the first few weeks. They had gone on their way. The whole process from birth to flying away took less than a month. It was such a joy to watch them. This is one of those recipes that you see on the restaurant menu but rarely make at home. I put together some of my favorite meats and cheeses and fell in love with the combination. 1. Preheat oven to 400 degrees. Spray a 13x9 baking dish with nonstick spray. 2. Cook the shells according to package directions, but for only 2/3 of the allotted time. They will be slightly underdone, which is how you want them. 3. While the shells cook, brown the turkey meat sprinkled with Italian seasoning. 4. In a large bowl, mix the three cheeses. When the meat is browned, stir it into the cheese mixture. 5. Stuff the jumbo shells with the meat and cheese mixture. 6. Pour a thin layer of sauce into the bottom of the pan. 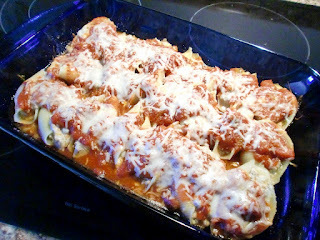 Place the stuffed shells in rows and cover with more sauce and cheese. So, I was sitting in a restaurant this weekend playing with my straw wrapper. I did one of those folds that accordions back and forth, and then it expands out to show all its pretty folds. This birthday card works on the exact same concept as that straw wrapper. It accordions alternately to make several spaces inside for signatures, pictures or Bible verses. Adhere a LONG piece of thread or other fiber to the top side of the square. Center the bottom edge of one strip in the square over the thread, tacking it into place, with the textured side of the strip facing the table. Overlap the second strip so that the edges match up with the other strip, with the textured side down. 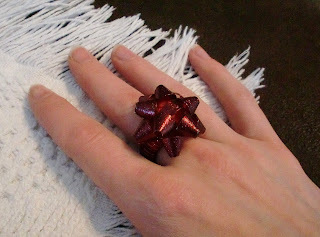 This adorable red gift bow ring was in my Christmas stocking this past year. Yes, I put it in there myself, but I still absolutely adore it! Now, I am not a big, gaudy jewelry kind of person. I like silver and I like subtle, but this ring just tickles me. I can't type in it, so I have to take it off at work. I try to only wear it on holidays that are celebrated with bow-topped gifts, but I generally wear it whenever I'm wearing red. Why would I want something that's so very much out of my character and comfort zone? Today is a gift from my Heavenly Father, all wrapped up with a beautiful bow on top. This ring reminds of that, even when the day is long...and difficult...and tiring...and stressful...and depressing...and painful. What is your desire this weekend? Do you have a to-do list a mile long full of things you'd love to get done? Is it your desire to get most of them checked off so you have a sense of accomplishment? Is your desire to relax and rejuvenate from the long week? Do you just want a few minutes of quiet to recharge your battery and reboot your internal computer? If your true desire is to get down to the water's edge, you'll break through the thick cover of branches and weeds to get there. If your true desire is to be the best possible child of God you can be, you'll tear down any walls that attempt to separate you from your Heavenly Father. If your true desire is to glorify and honor the Lord in all that you do, nothing (and no one) will stand in your way. 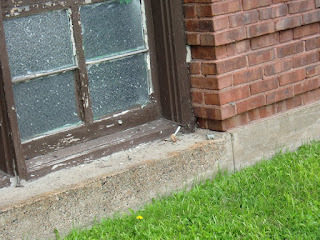 One of the neatest parts of living in the country has been exposing the girls to things they never saw in the city. Sadie loves to chase the geese, and Bailey really tries to peek in the bird's nest to see the babies. 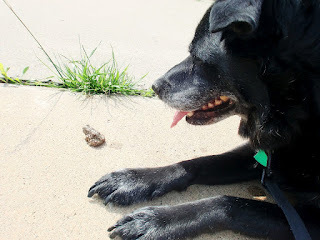 And just this week, Bailey discovered her very first frog. No, she didn't try to kiss it and turn it into a prince. But she did try to eat it. Well, she carried it around in her mouth anyway. We had to have a quick lesson in "Frogs Are Friends, Not Food." So instead of snacking on it, she decided to follow it around the driveway. Apparently she scared it stiff, because it just sat there for long stretches watching her. Eventually she sat down next to it and just watched it back. Every now and then she would nudge it with her nose and it would hop a foot or two away. Then she'd get up, walk over to it and lay back down. She must have done this four times over the course of 10 minutes or so. 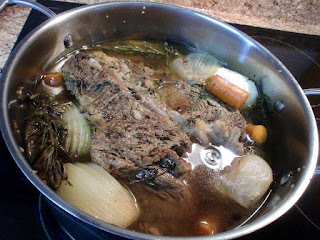 When fast food is getting boring or you need some real food in your diet, you'll turn to this pot roast time after time. In just a couple of steps, and in one pot, you'll be able to put the pot in the oven and walk away, letting the ingredients themselves do all the cooking for you. 2. Heat olive oil in large pot over medium-high heat. This is the same pot you're going to cook everything in, so make it a big one! 3. Brown the onions in the hot oil and remove. Brown the carrots and remove. 4. Add a little more oil if necessary. Generously coat the roast with salt and pepper. Brown all sides in the hot oil. Remove. 5. Deglaze the pan with broth, scraping up all the little brown bits, until simmering. A woman contacted me through our etsy shop a few weeks ago to see if I could put together some party favors for her son's birthday. She had seen the alphabet book I had in the shop and wanted five of them. Well, I agreed, and it's been such a fun project! 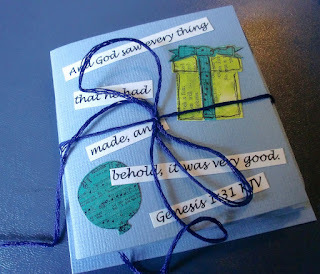 I didn't have the exact papers and embellishments anymore, so I got to use up some extras I had stored up. She wanted primary colors, so that part was easy. I had tons of letter stickers to use throughout all five books, and it was fun to mix and match to make it all work. But believe it or not, the best part was combing through my sticker collection over and over again to find pictures that would go with each letter. 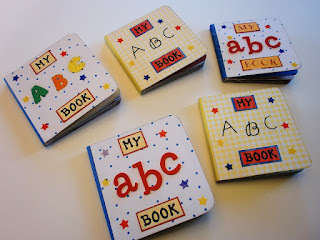 I had used a set in the original book that was an animal and the letter all in one sticker, but I didn't have any more and couldn't find them again. What Good Is Happening In The World? While visiting an online forum for small business owners the other day, a certain post touched my heart. A woman was having a particularly bad day - something women and business owners alike know something about. She had come to the forum to find help and support. Her question was this - when things are going so terribly wrong in my own life, what good things are happening in the world? The responses were immediate and incredibly uplifting. * Good things? The sun is shining and I'm alive to see it! * I woke up this morning, there's food in the kitchen, my family is healthy and I have a roof over my head. What more do I need? 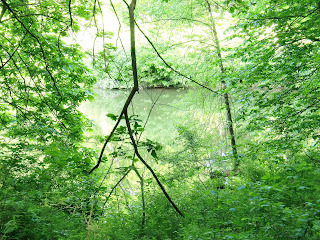 * There's a place like this (forum) to come and find the help I need. You came here, and I hope you find some support, too. * I have been blessed with my own business, loyal customers, great employees and the potential to have great success in what I do. I took a picture for the paper last week and this lamp was in the background. In every single picture, there it was just glowing. If you've ever done any adjusting of photos on the computer, you know how hard it is to turn down a glow. It monopolizes the entire picture and every other surface you've captured. 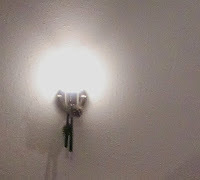 You can't minimize the light without changing everything around it. Make this a weekend of glowing. Make it difficult to turn down your light. Make your light shine so brightly that everything you do glorifies God. Glow. Shine. Ah, it seems like yesterday that they were eggs. 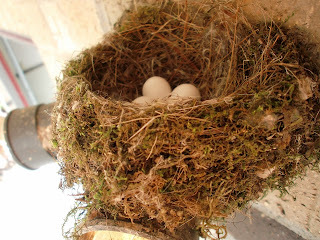 I remember the joy and surprise of four tiny little eggs in the nest. And now they're so big, the four of them almost don't fit in the nest anymore. 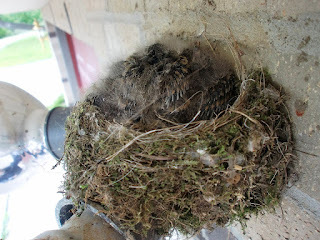 Mama bird has to sit on them with her head all bumped up against the overhang because they're so fluffy now. The girls discovered them this week, too. The nest is way up at the top of the garage, on top of the security light, far out of puppy reach. But Bailey can smell them, so she'll stand up on her back legs and try to see them. So cute! Soon these little babies will be trying out their wings and then venturing out on their own. Ah, little ones grow up so fast these days. 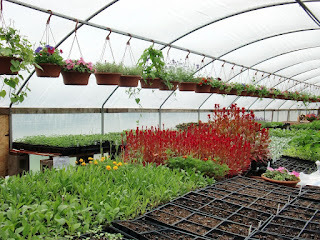 I've been doing a lot of stories at the newspaper over the past couple of weeks about spring gardening. I absolutely love it because all of the color lets me know that winter is far behind us now. I probably just jinxed it and we'll have a foot of snow next week! One of the landscaping experts I spoke to had a wonderful thought on the subject of plants. He said, "No matter what the economy, no matter what condition your life is in, art and plants will bring a smile to your face." Make this a weekend of planting a little joy in the garden that is your own personal world. I pray you'll find a special way - either with flowers in the soil outside your door or in the hearts of the people you love. At different times in my life, I've tried being everything and anything to everyone. I've tried turning inward and turning toward other people. I've tried conforming and I've tried to be my own person. I've tried to be perfect and I've tried to be what I thought I was supposed to be. I've tried using as many words as possible and I've tried no words at all. I've tried trying to understand it all and I've tried resigning to the fact that I'll never understand anything. I've tried focusing on one goal in life and I've tried spreading myself too thin. I feel like an aunt showing off baby pictures! I've been waiting for absolutely forever to get these pictures. Just Monday they were still four little white eggs in the nest. But God was working inside them, making four new little creations. And here they are! Four perfect little baby birds, just hours old. They're not even chirping yet, they're so new. I had been checking the nest every few hours just to see if they were out yet. And then all of a sudden ... babies! Mama is still very protective and won't leave the nest for very long at a time. You can tell by the picture that they're ready to eat and grow, so I'm sure she'll have a busy time of it for the next few weeks. The world God has created is so full of little joys. Here are four of them just beginning their time on earth. How miraculous our Lord is.